I love going to the movies and just forgetting everything else exists for these few hours. There is something about the dark room and giant screen that makes me relax and focus only on the story in front of my eyes. It’s also a great way to find inspiration for future stories. “The Warrior and The Dragon” is a story about a warrior who is seeking justice for her village and her father’s death. She goes to a dragon’s cave to kill him but ends up finding a girl there instead. It plays a bit with grey morality and how history has many different sides depending on how you look at it. I wrote this story because I wanted to try to work with fantasy in a different way from what we see in so many mainstream stories. Usually, the secondary worlds we see are inspired by European medieval times. But here, I wanted to work with a world based more on nature and small communities, away from royalty and castles. And of course, I always try to bring something from Brazilian culture to my stories so I tried to get inspired by names and places I know from my country, bringing also different kinds of dragon legends to its lore. 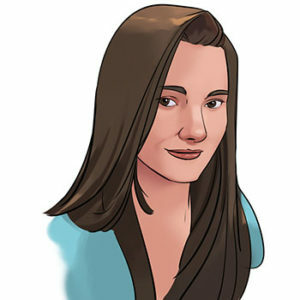 M. Hollis is a Brazilian YA/NA writer with a focus on F/F stories. When she isn’t scrolling around her social media accounts or reading lots of femslash fanfiction, you’ll find her crying about female characters and baking cookies. She wants to write many stories for women who love other women with happy endings and hopeful beginnings.